Can I bring NARAL to class, please? This post first appeared on Live Action News. NARAL is calling on abortion supporters to sign a petition urging Nebraska to investigate Judge Peter Bataillon, after he denied a request for a Judicial Waiver of Parental Notice of Abortion. Because he made a decision they disagree with, NARAL now wants Judge Bataillon investigated on the basis that he once represented members of the pro-life group Operation Rescue, and was once the President of a local Right to Life organization. 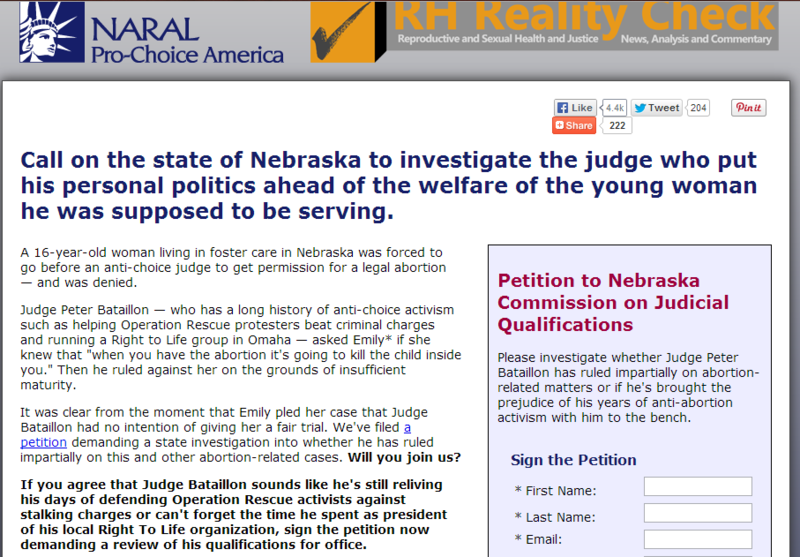 Apparently, NARAL thinks being pro-life means you aren’t qualified to be a judge. Unfortunately for NARAL, there is no way for Nebraska to investigate the judicial decisions made by a judge due to a little thing called “Judicial Immunity”. Basically, this means that a judge cannot be held liable in civil or criminal court for a ruling made from the bench. In the case Bradley v. Fisher in 1872, the Supreme Court ruled that “A judicial officer, in exercising the authority vested in him, should be free to act upon his own convictions, with out apprehension of personal consequences to himself. “ This is precisely what Judge Bataillon did, and he cannot and should not be punished for doing his job. These allegations are clearly false- not only did the Nebraska Supreme Court ruled 5-2 that Judge Bataillon made the correct ruling, but in his 2012 State Bar Association Rankings 89.6% of lawyers recommended that he retain his position on the bench, with impartiality and fairness being factors in that ranking. But even if Judge Bataillon had done something wrong in this case, which is not the case, the law is clear that even when an act is acts are in excess of their jurisdiction AND are alleged to have been done maliciously or corruptly, Judges cannot be held liable for them under the principle of judicial immunity. Not only are NARAL’s accusations false, but they are dangerous and fly in the face of long established law. Imagine what would happen, if every decision a judge made could lead to an investigation, or a lawsuit; judges would be afraid to rule on important issues that might not be popular, or against parties that have political influence or are wealthy enough to cause them trouble. It would completely cripple our legal system! NARAL should end their witch hunt against Judge Bataillon, instead of continuing to persecute Judge Bataillon for pro-life beliefs.